The United State Post Office has launched a series of mailing promotions and incentive programs for 2019. As in years past, these programs offer discounts on postage for mail pieces that take advantage of the unique marketing properties of physical mail over email and other forms of electronic communications. 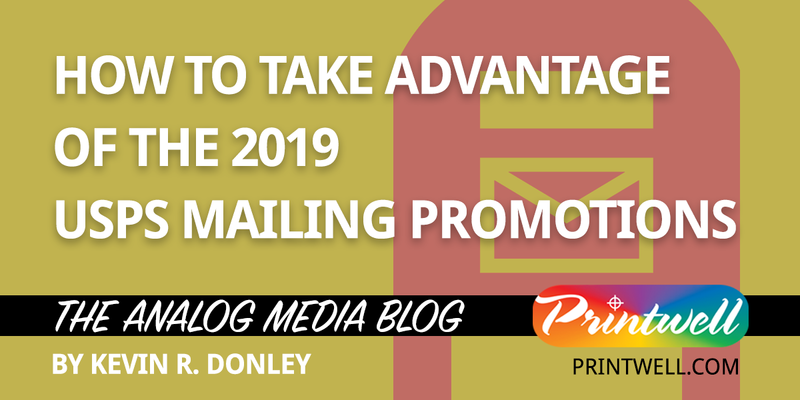 The USPS promotion and incentive programs are also designed to encourage consistent direct mail marketers to try something different with their 2019 campaigns. Ultimately, the goal of the USPS is to demonstrate that direct mail that has these enhancements will result in improved customer engagement and higher response rates. Each USPS program offers a 2% discount off at the postage line level. This means that the discount is applied after the postage statement has been calculated. Prepare the concept and design of the mailed piece in consultation with your mailing service provider. Submit a hard copy mockup/proof of the concept to your mailing service provider. The mailing service provider will submit the concept to a USPS design analyst to confirm that the piece qualifies for the discount or incentive program. Allow up to 30 days for the approval process to be completed. At Printwell, we are committed to keeping customers informed about opportunities to improve the impact of their direct mail marketing programs and to reduce costs. Please contact your account representative for a consultation or send us a message here and someone from our sales team will get in touch with you. ← Is print having a 21st century Renaissance?